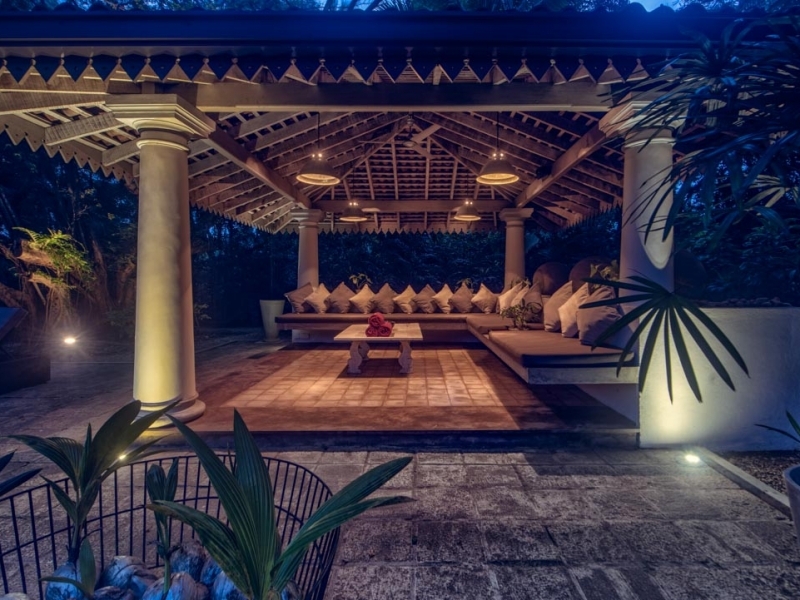 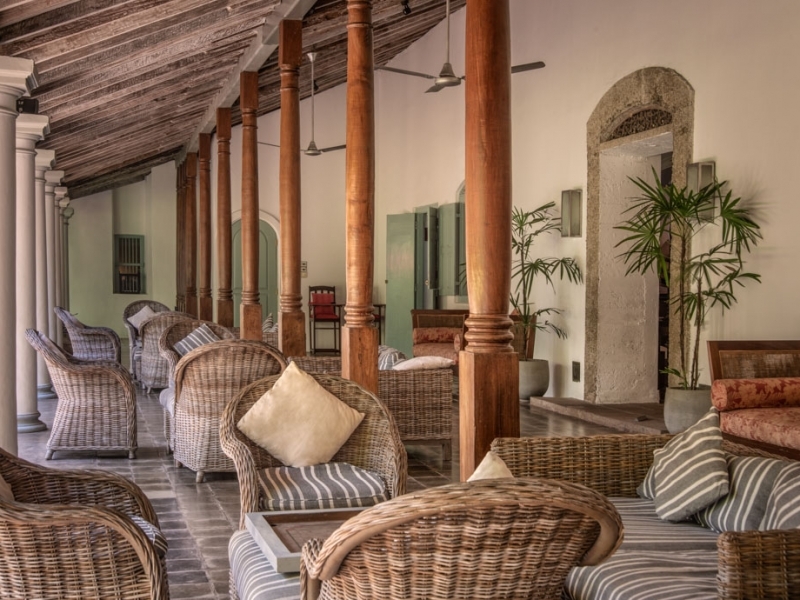 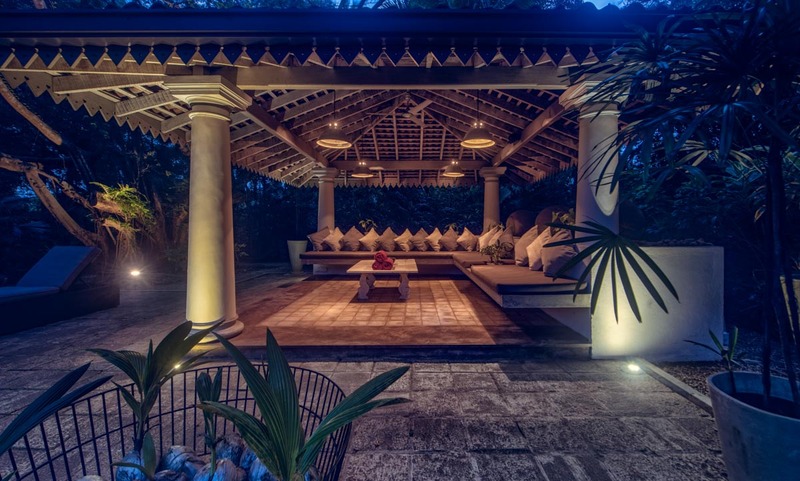 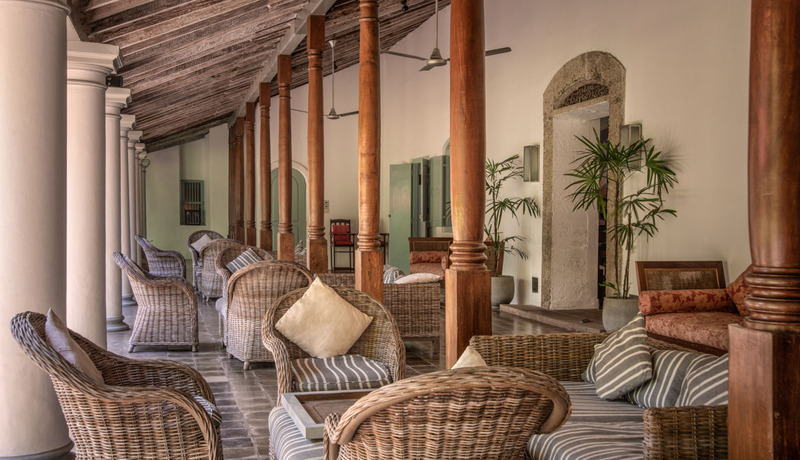 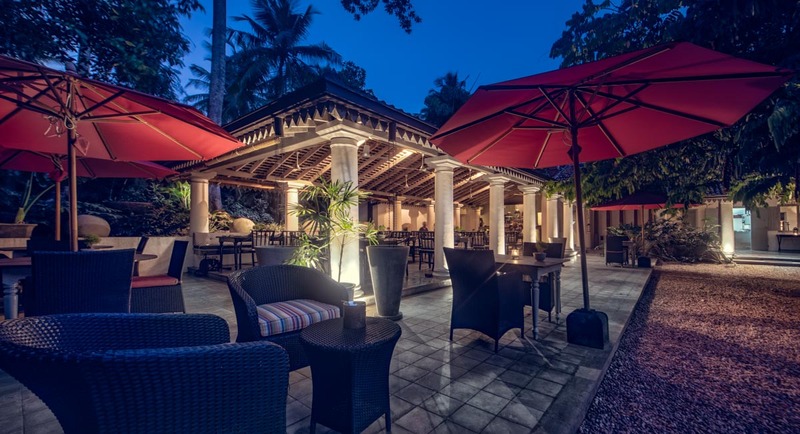 Set in 200-year-old tropical gardens just 15-minutes’ drive from Sri Lanka’s main international gateway, this award-winning 18-bedroom country house hotel with gourmet food, jungle pool and heavenly spa, carved out of an atmospheric 18th century manor house, exudes style and serenity. 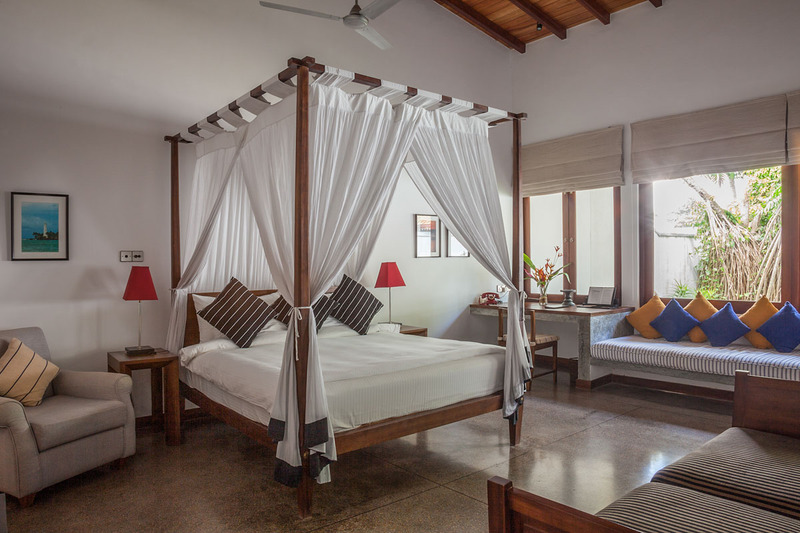 As an alternative to hotels in Negombo, The Wallawwa promises to start or end your Sri Lankan holiday in style. 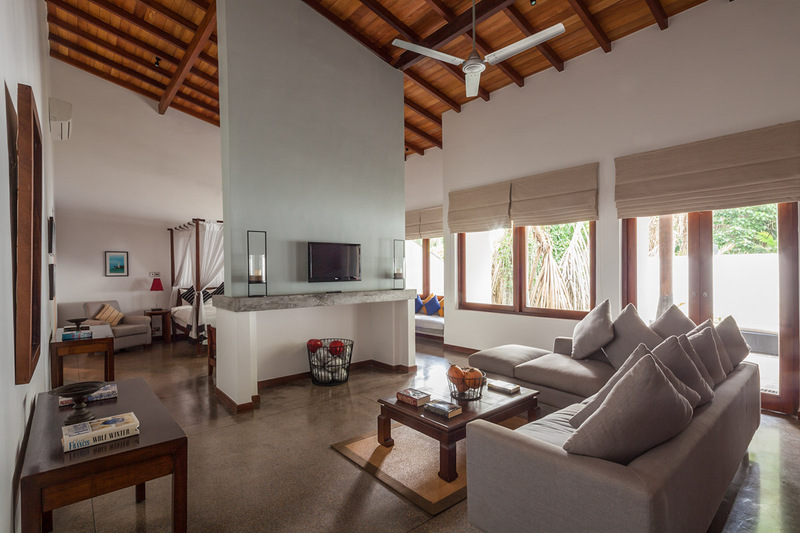 18 stylishly furnished rooms, including two family suites and a luxurious two-bedroom suite with pool, promise beautiful garden views, lavish furnishings and modern amenities. 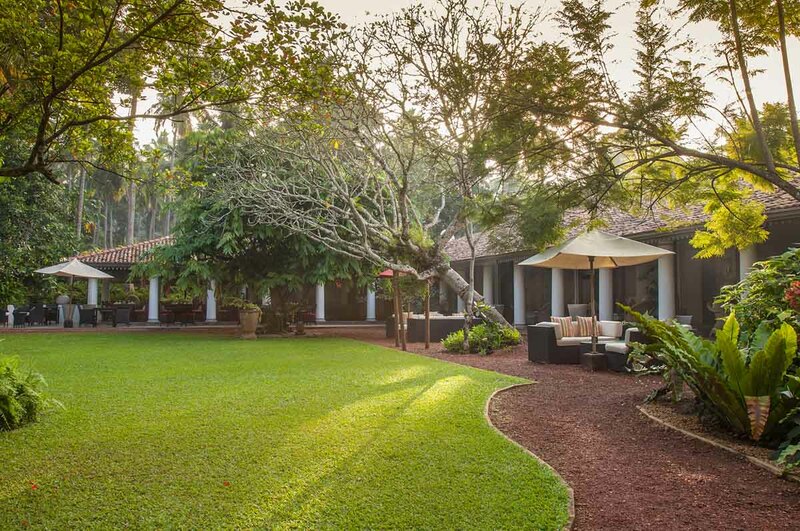 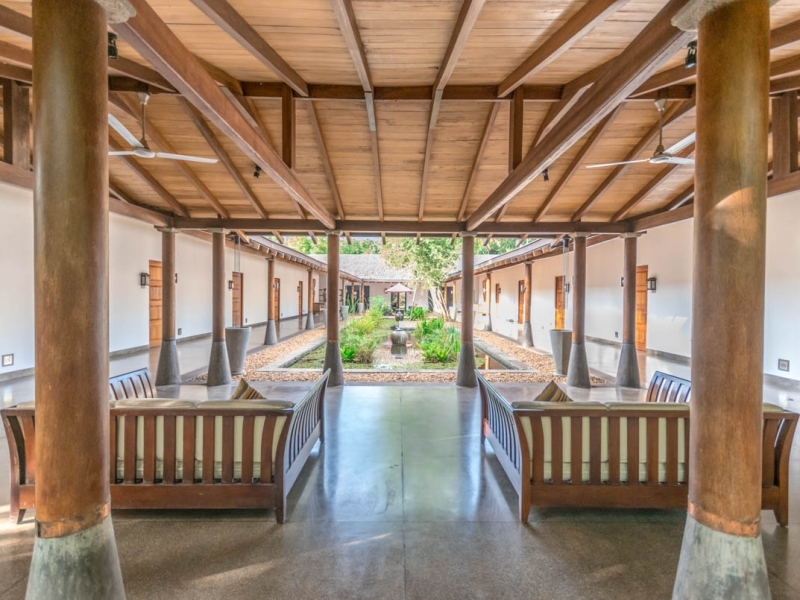 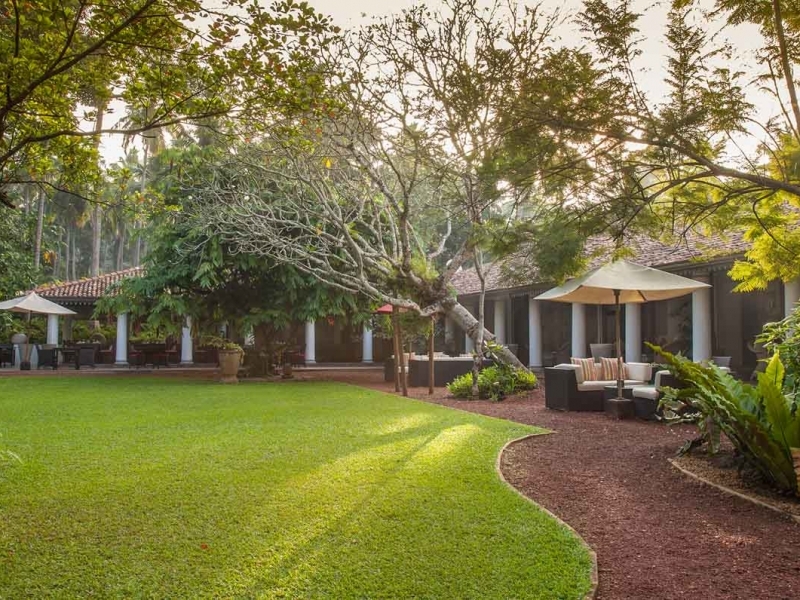 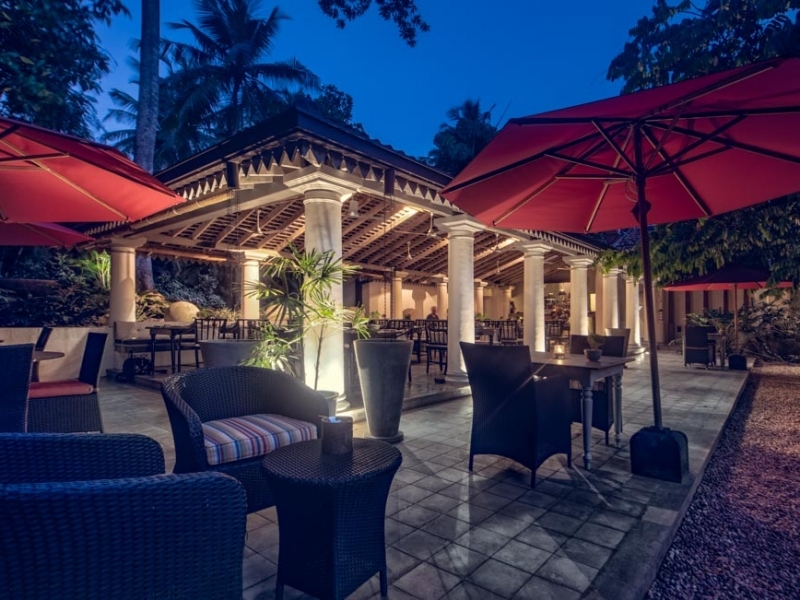 The convivial open-sided restaurant, The Verandah, serves exquisite a la carte Asian Fusion cuisine throughout the day to tables overlooking the 200-year-old tropical gardens. 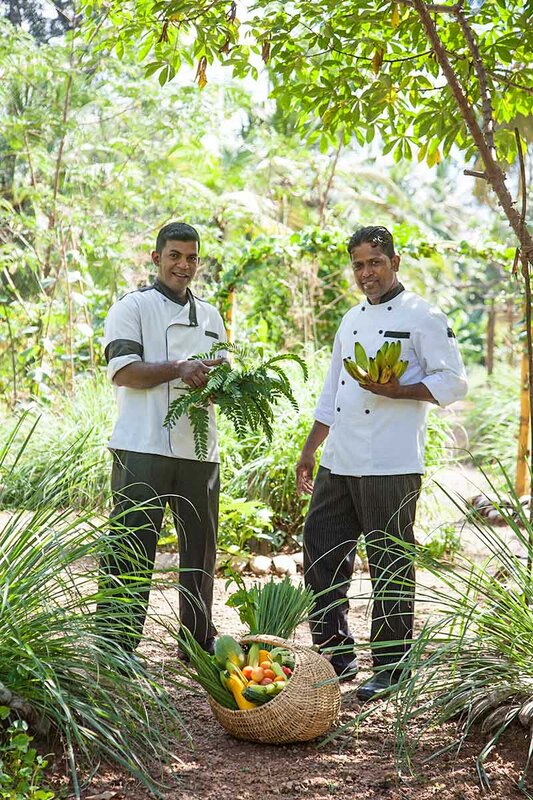 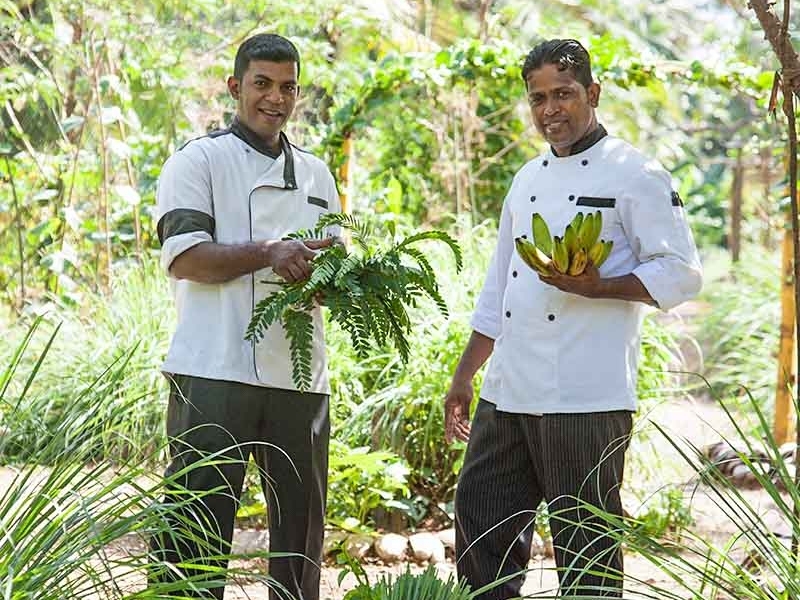 Their innovative menus use the finest local ingredients, and many of the fruits, vegetables and herbs used in the freshly cooked meals are plucked daily from the extensive kitchen garden. 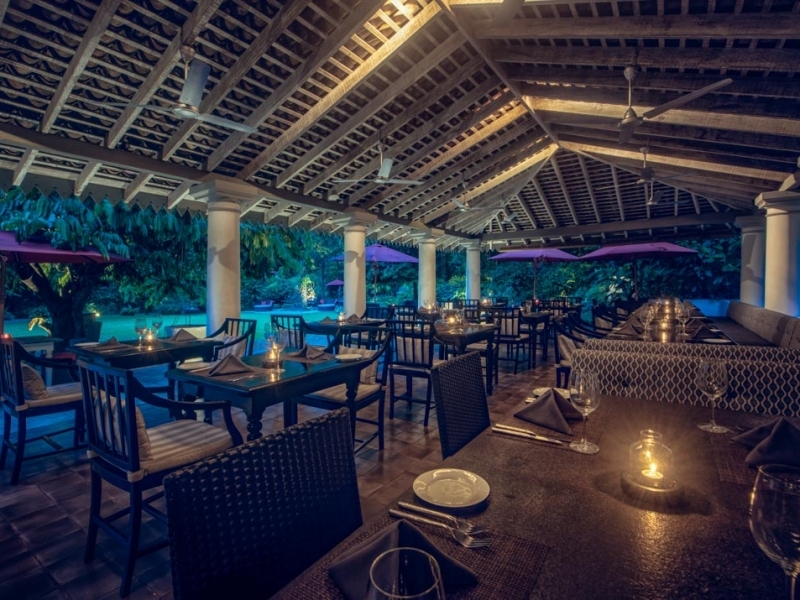 The chefs can cater to all dietary requirements with prior notice, and a kid’s menu, BBQ menu and in-room dining menu are also available. 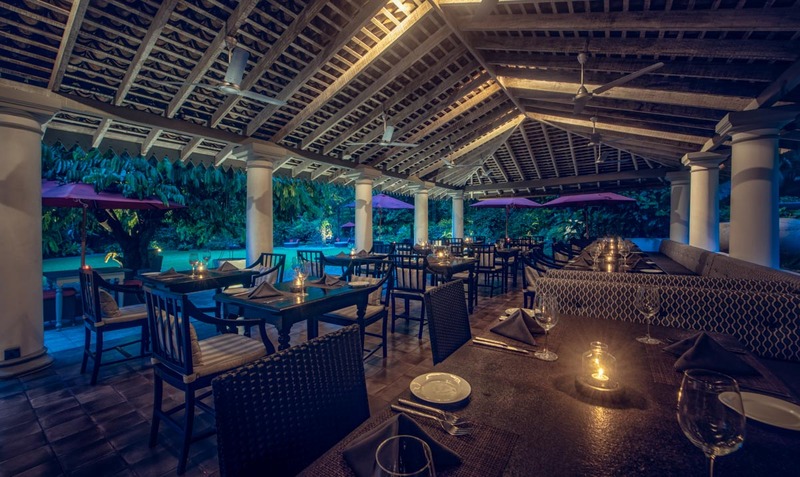 A selection of fine wines, cocktails, spirits and beers perfectly complement their menus. 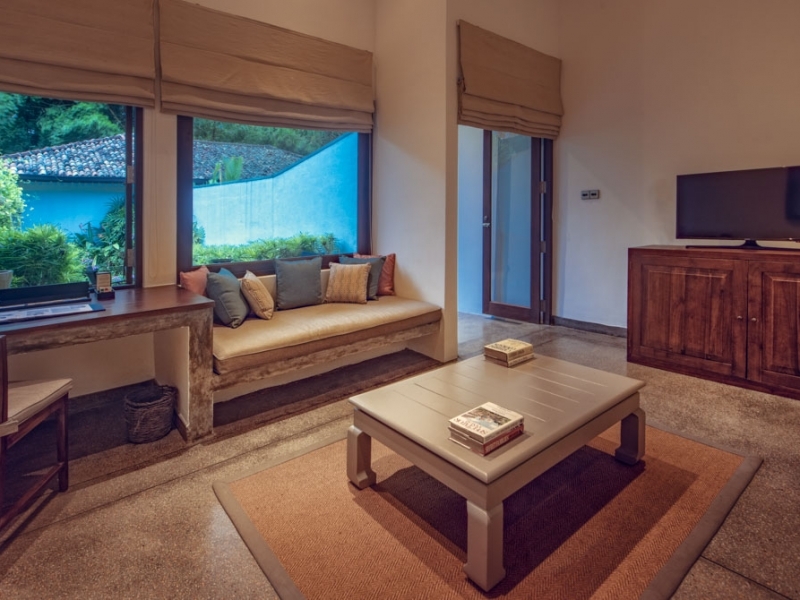 The two-bedroom Mountbatten Suite is as generous as a private villa, boasting a sitting room and a private garden with plunge pool. 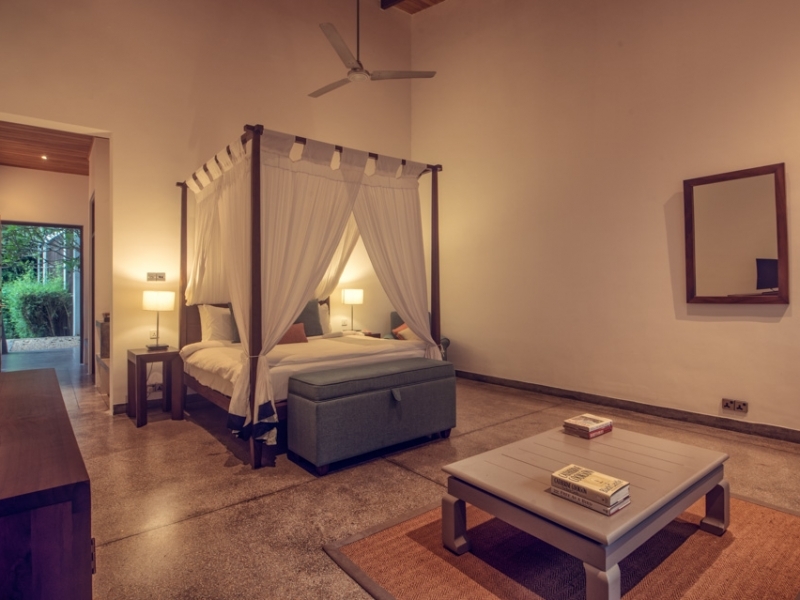 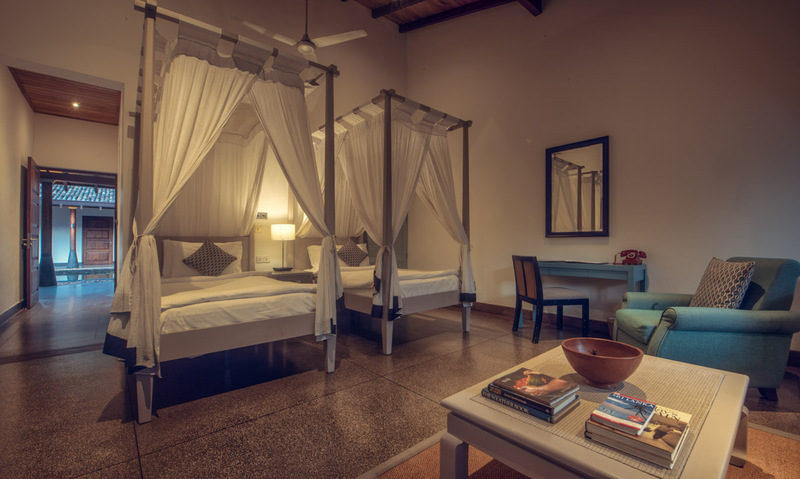 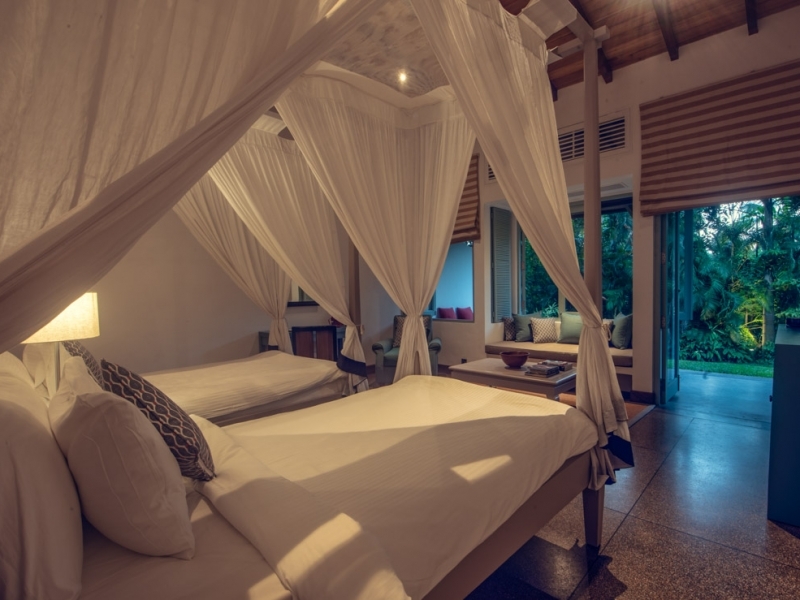 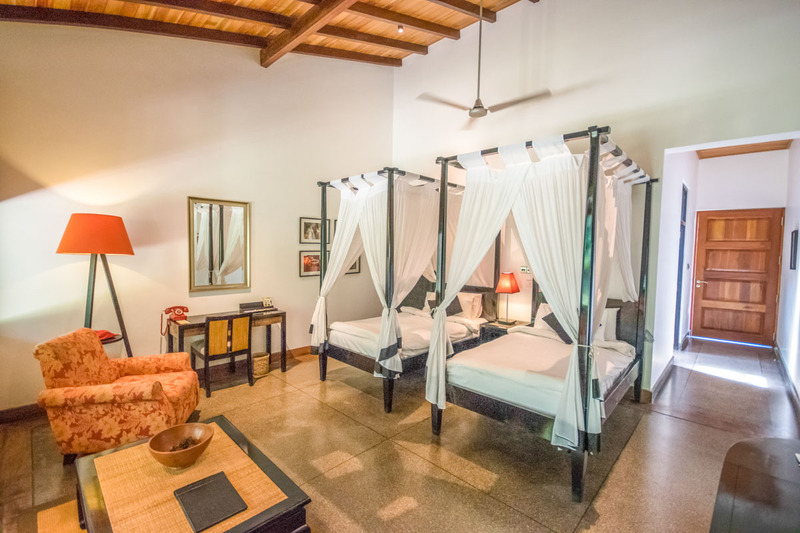 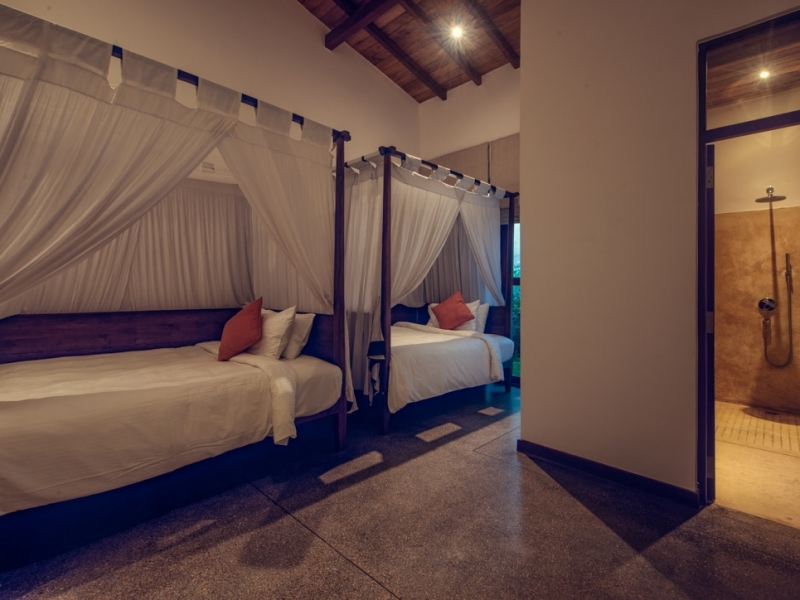 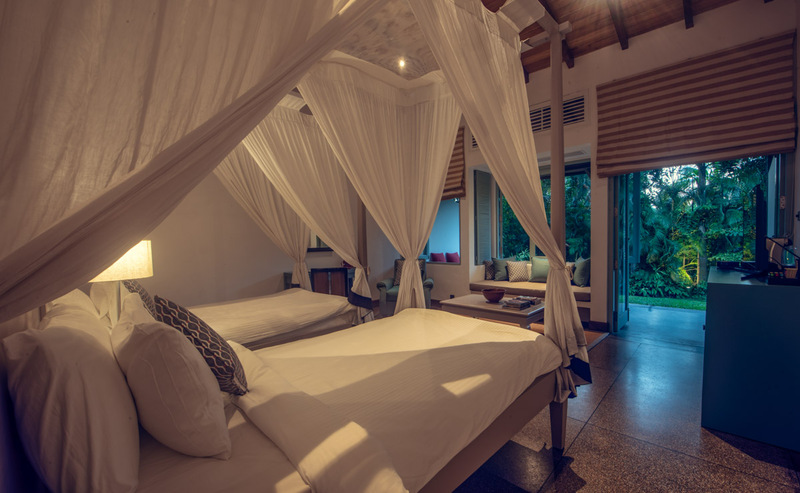 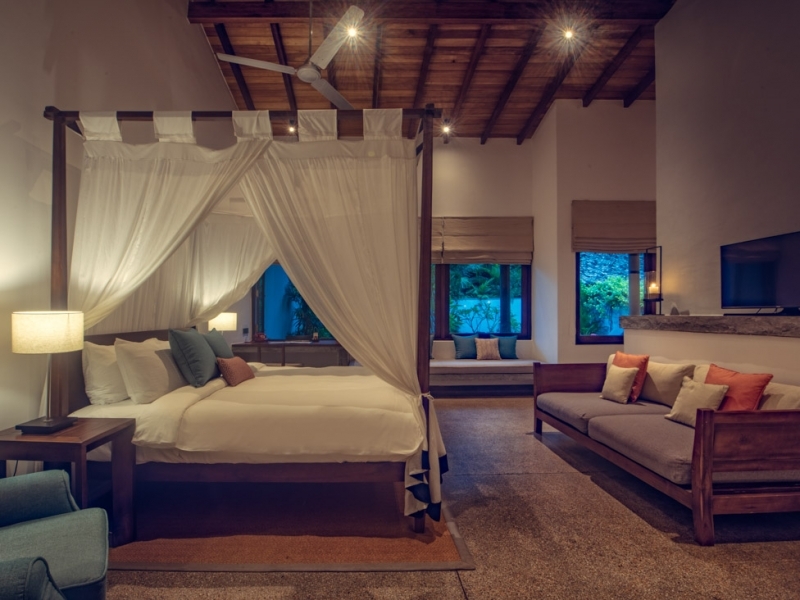 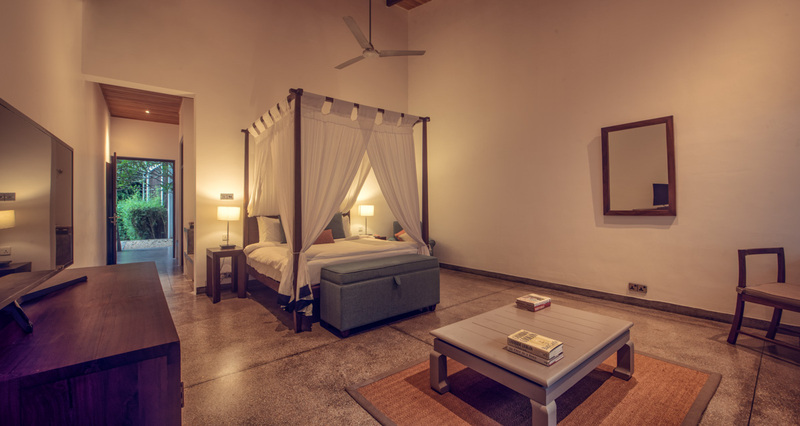 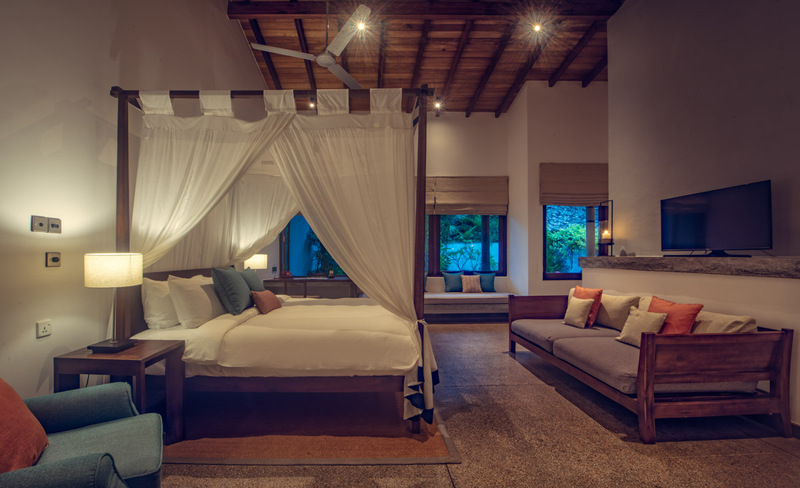 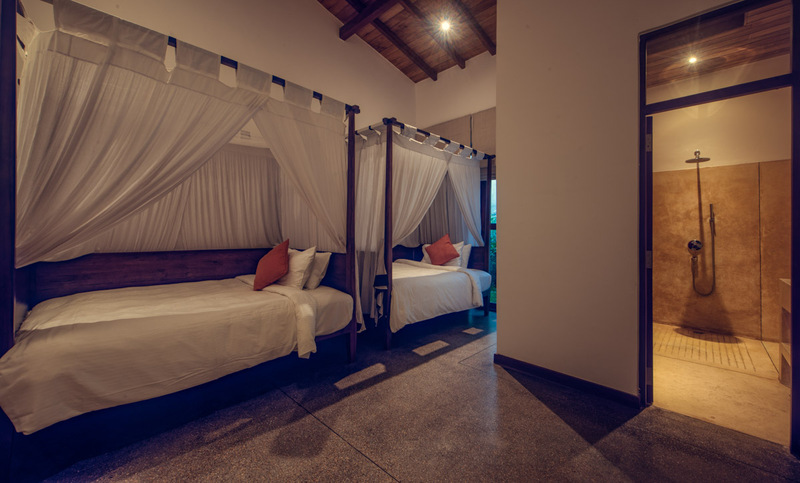 The master bedroom has a grand four-poster garden-facing bed and an ensuite bathroom with rain shower and freestanding bathtub, and its open plan design incorporates a sofa-furnished lounge. 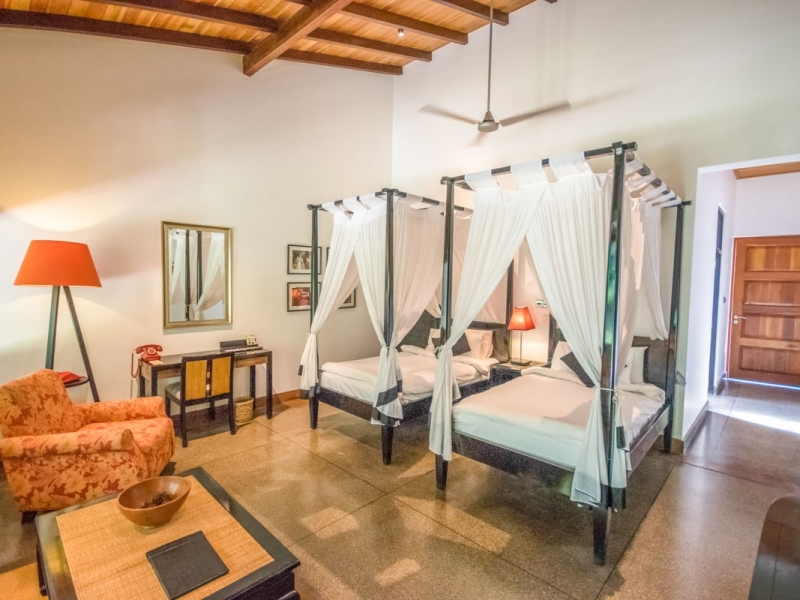 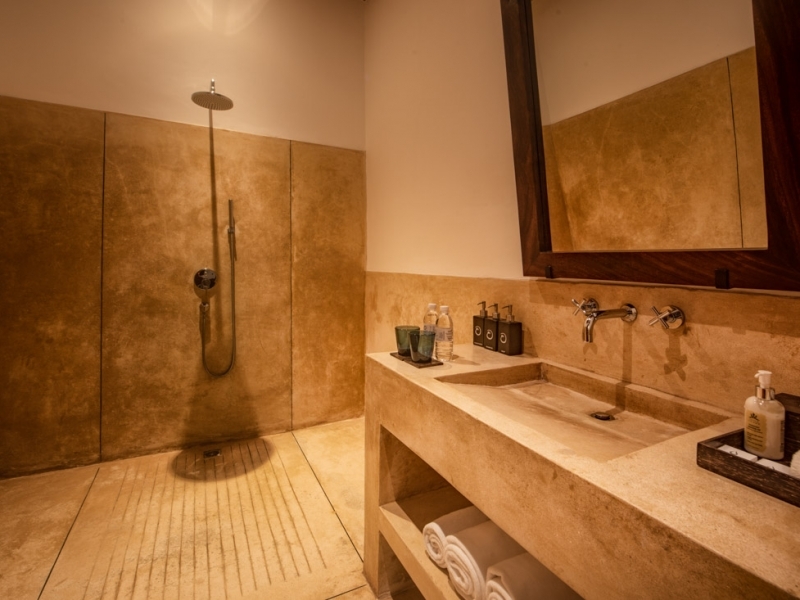 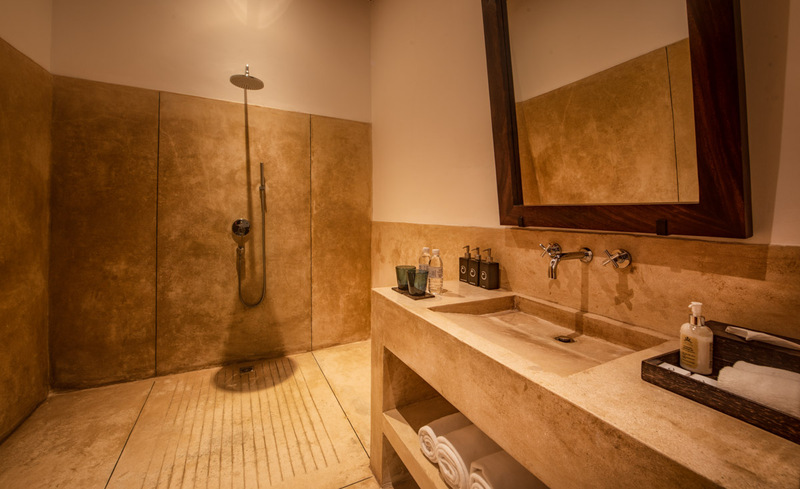 The second bedroom – furnished with queen-sized twin beds – also has its own shower room. 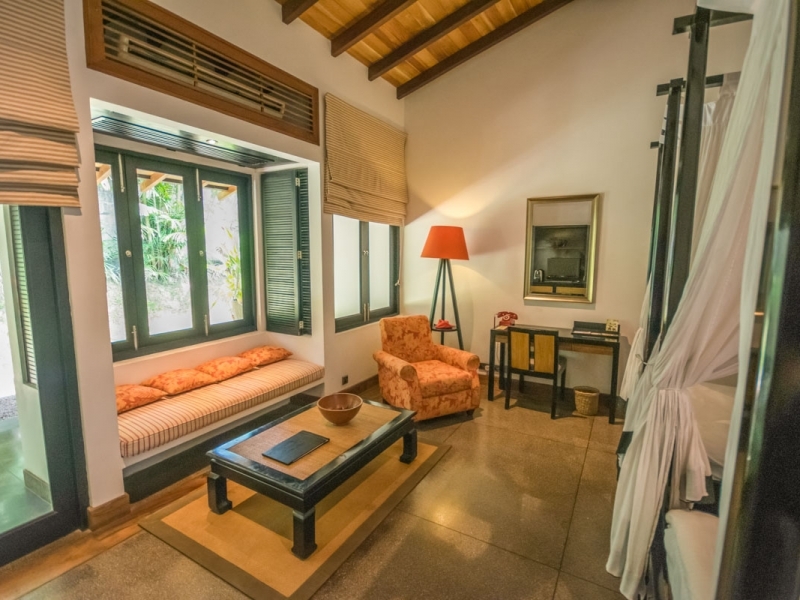 The suite is equipped with walk-through wardrobes, cable television, retro phone and mini bar. 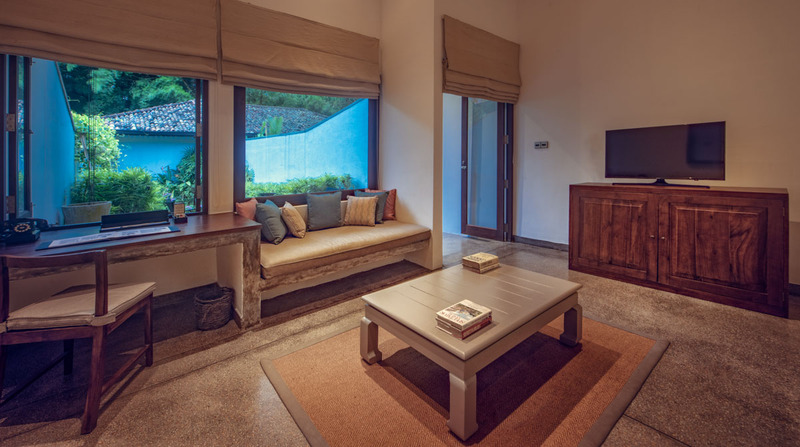 Our garden-gazing two-bedroom Family Suites promise each member of the family comfort, space and exclusivity. 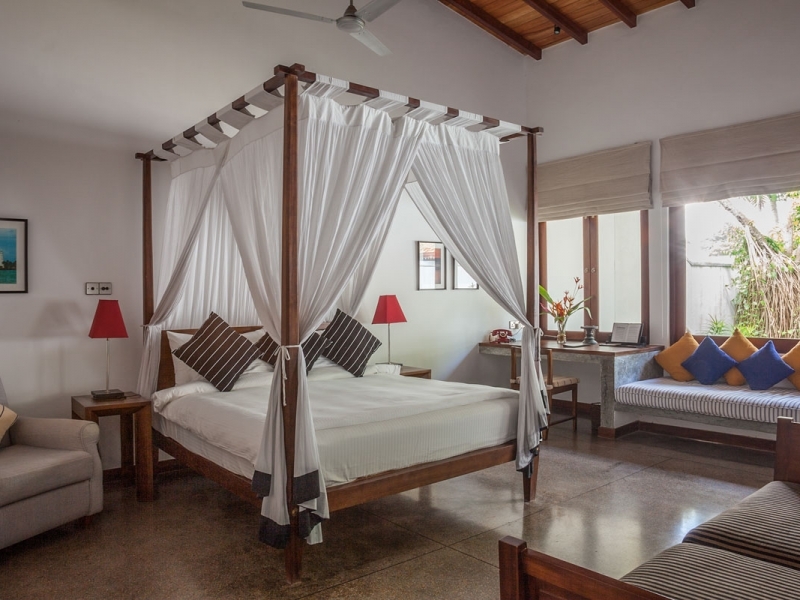 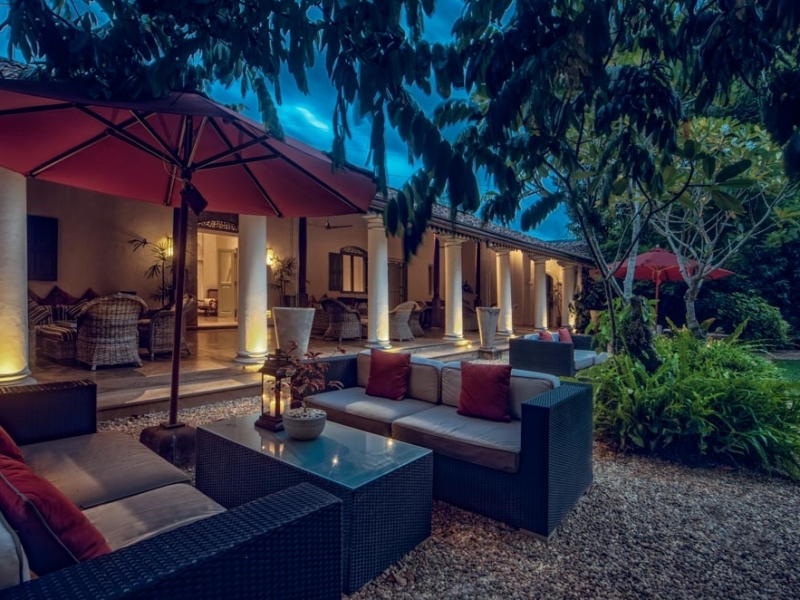 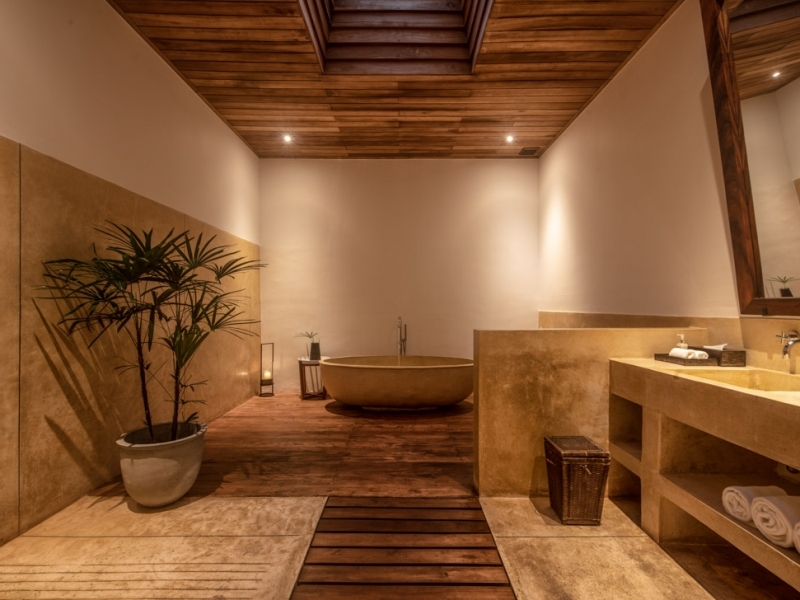 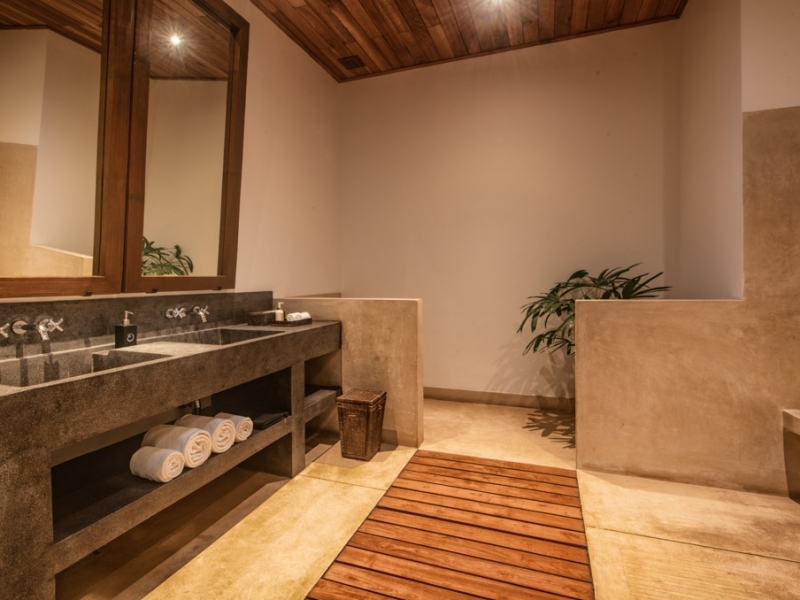 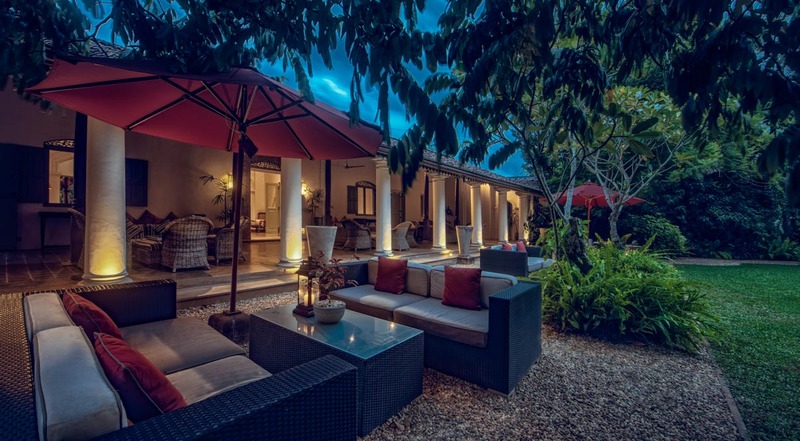 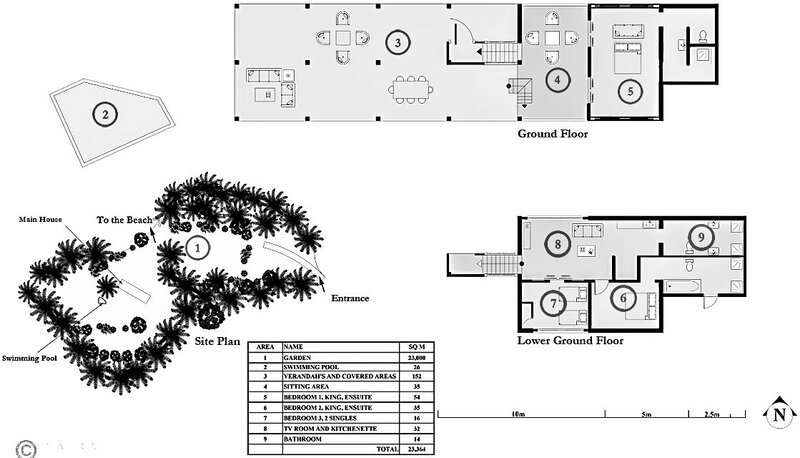 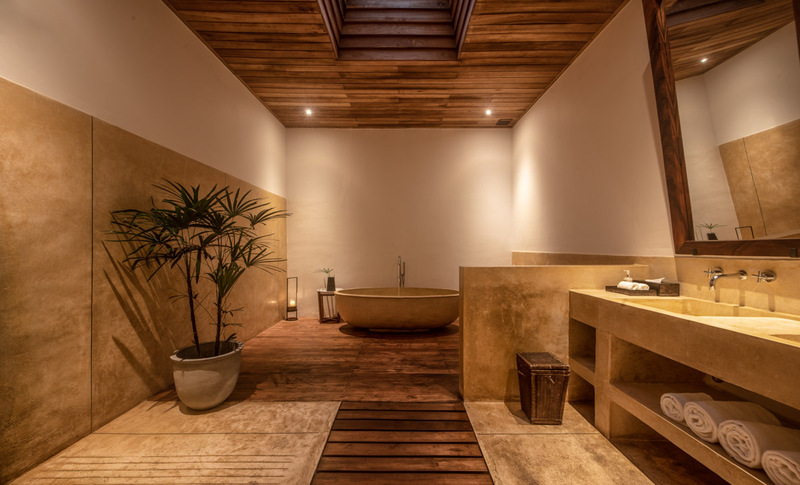 These private havens comprise of a double Garden Suite with ensuite wet room and a smaller, interconnecting twin-bedded Wallawwa Bedroom with its own bathroom and rain shower. 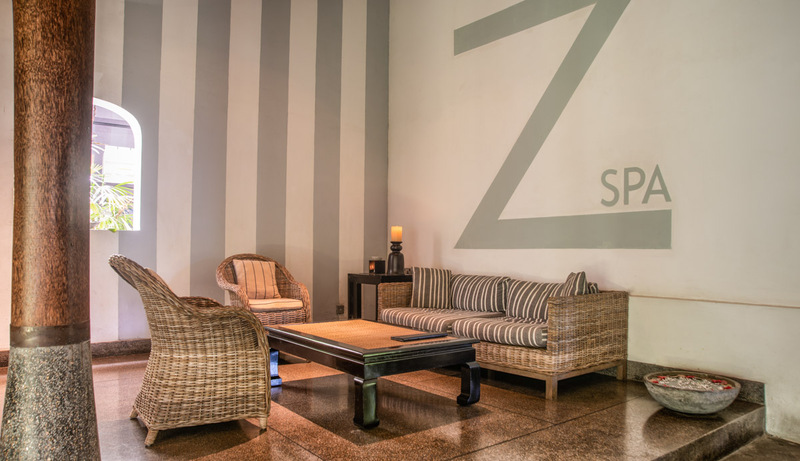 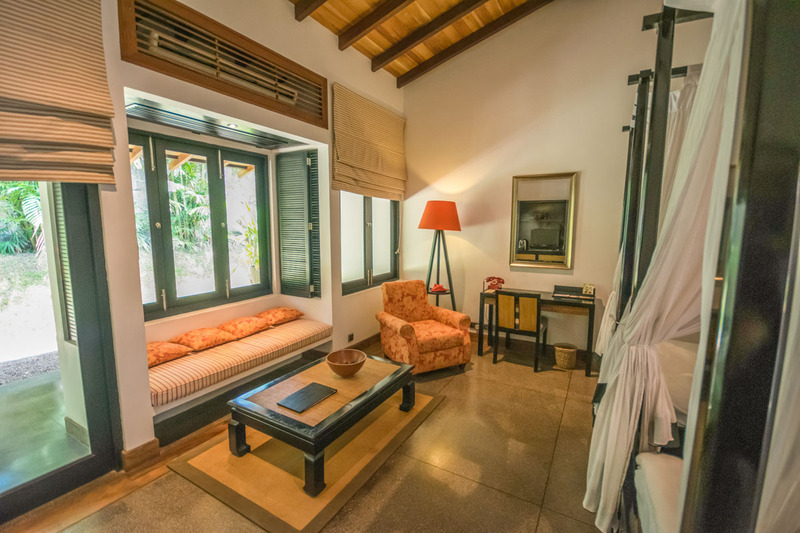 Suites directly access the garden, and in-room amenities include cable televisions, mini bars and retro phones. 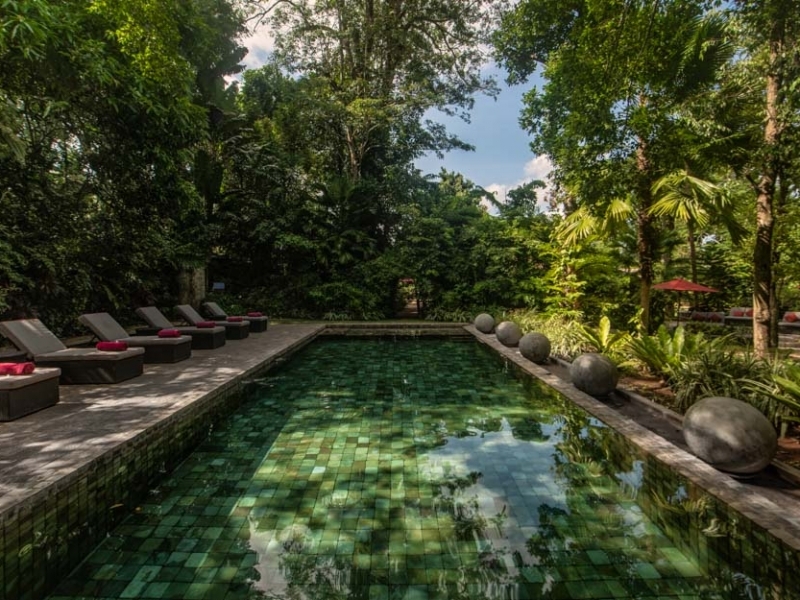 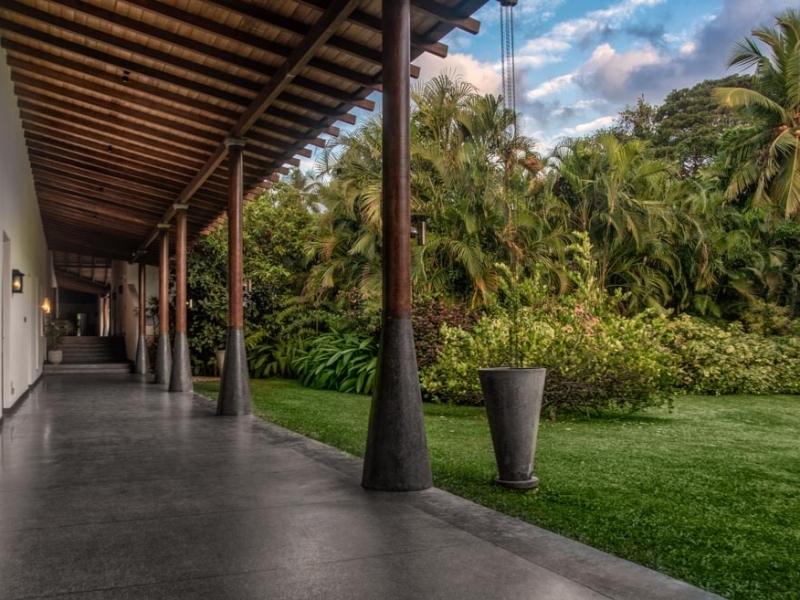 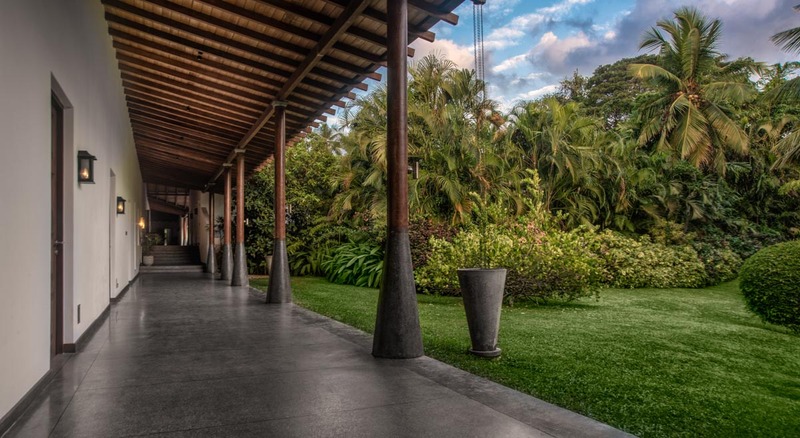 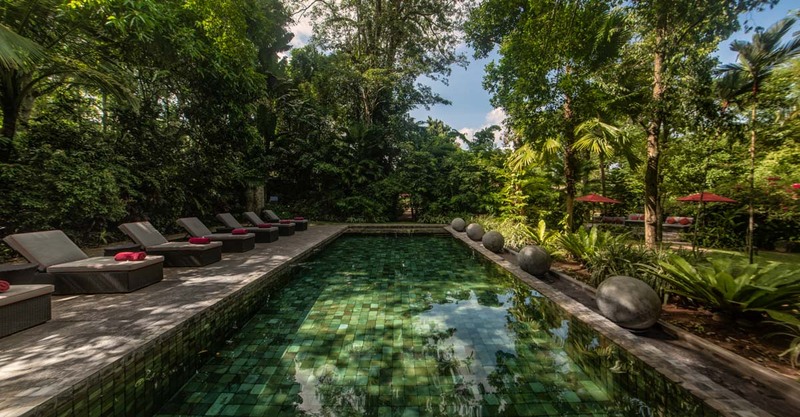 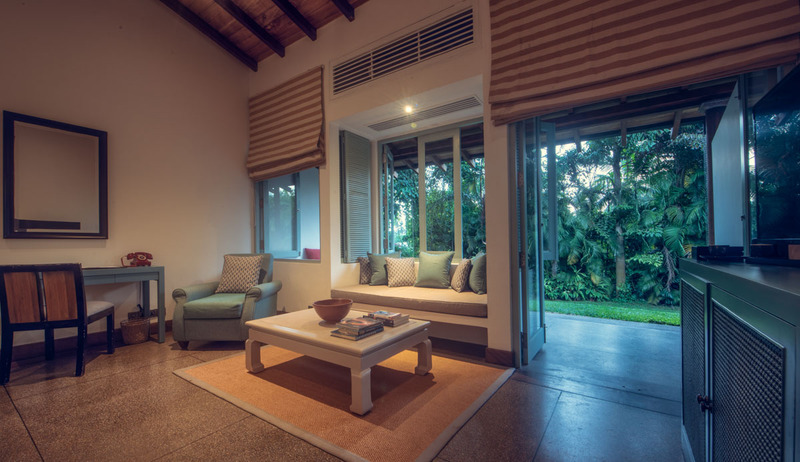 Spacious and light-filled, the Garden Suites overlook and directly access lush lawned gardens fringed by borders of tropical shrubs. 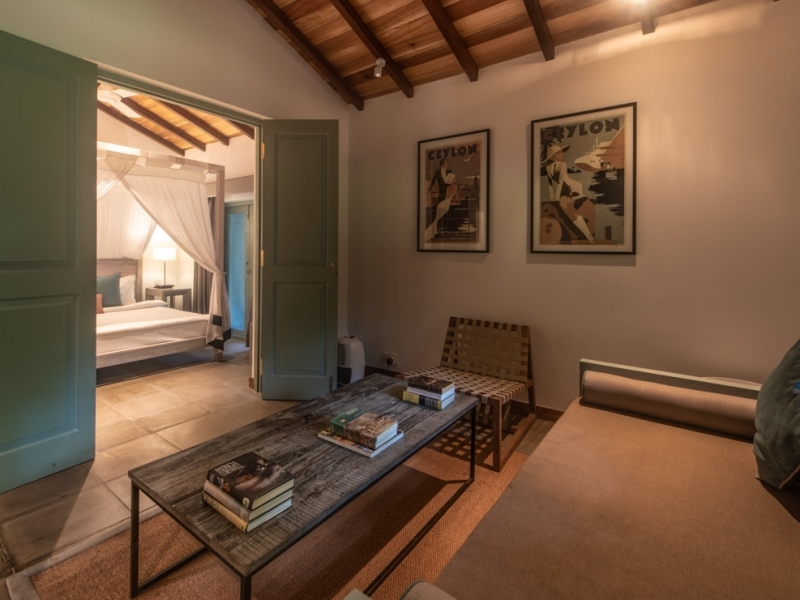 Ideal for post-flight lounging, they feature king-sized or twin four-poster beds, comfy armchairs, day bed window seats, ensuite wetroom with rainshower and further cushy seating on a private garden veranda. 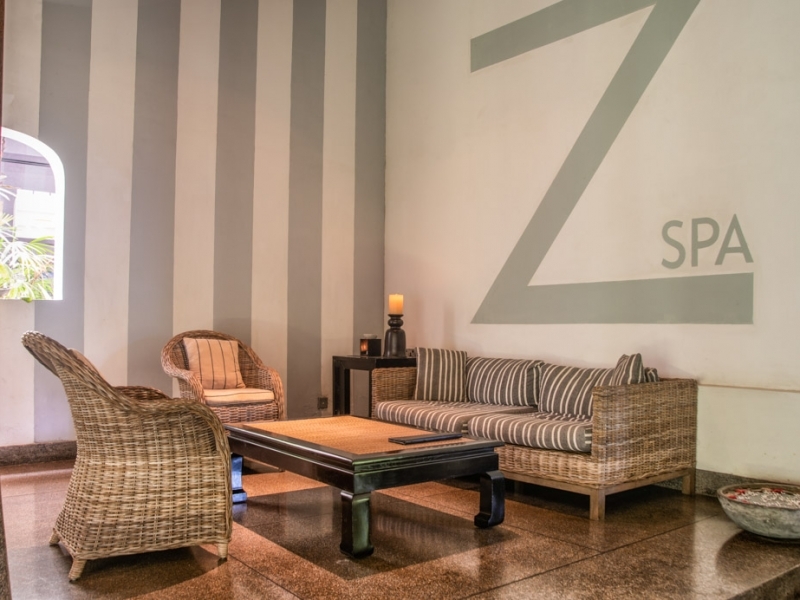 Amenities include mini bars, cable televisions and retro phones. 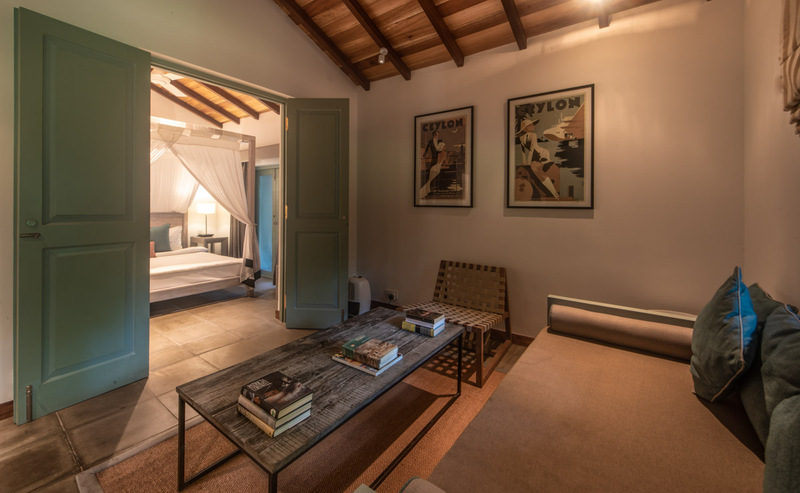 Stylish bedrooms designed to pamper guests with all the essentials for a good night’s sleep, including luxurious four-poster beds adorned with crisp linen sheets and lightweight duvets. 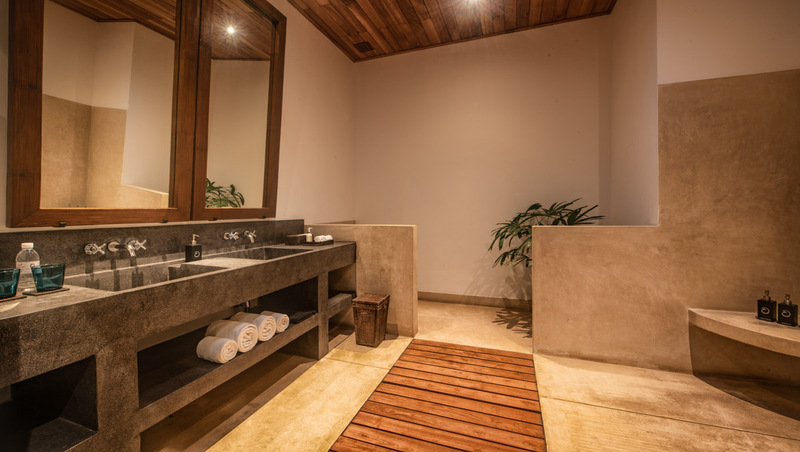 Equipped with mini bars, retro phones and cable televisions, Wallawwa Bedrooms have ensuite terrazzo-lined wet rooms with rain showers. 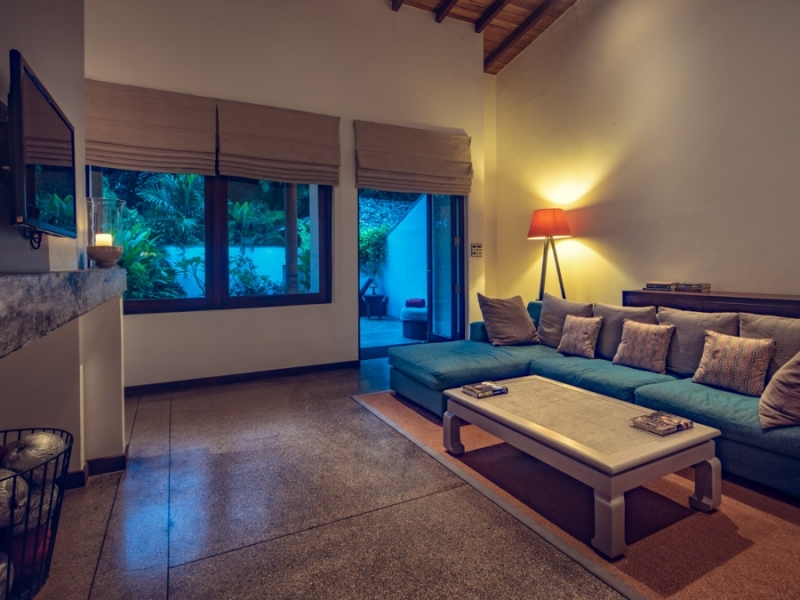 They are perfect for those looking for stylish yet affordable accommodation near Colombo Airport. 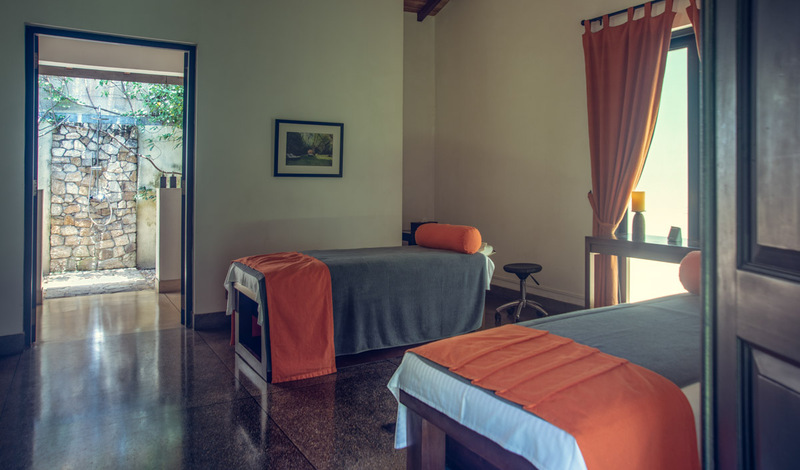 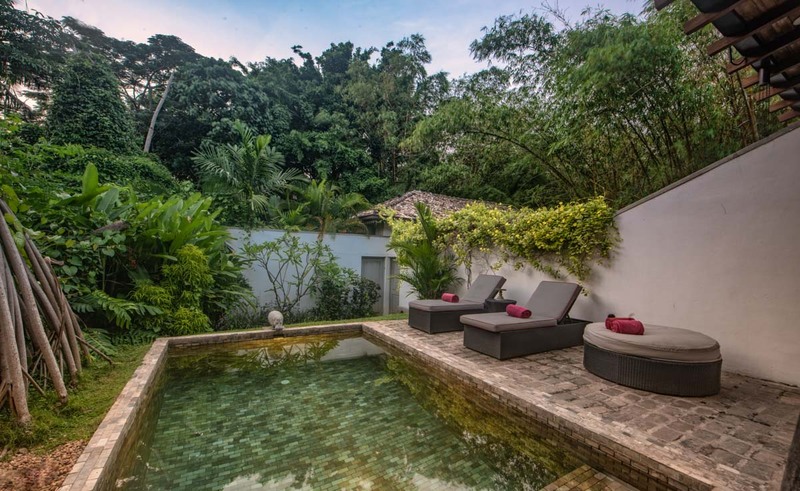 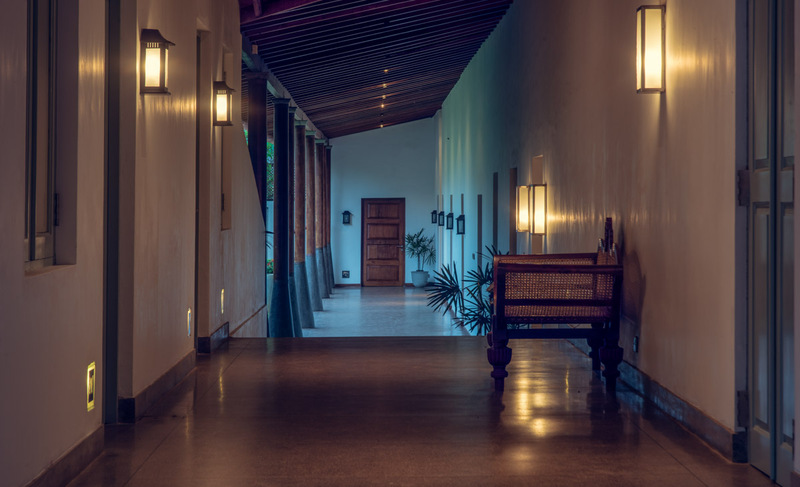 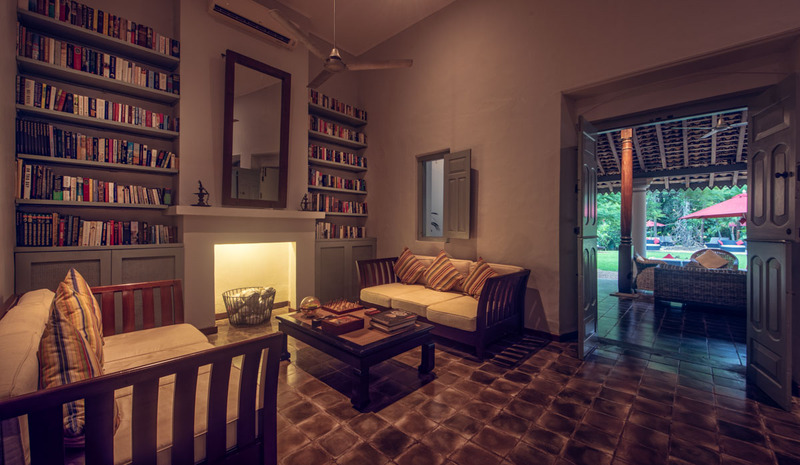 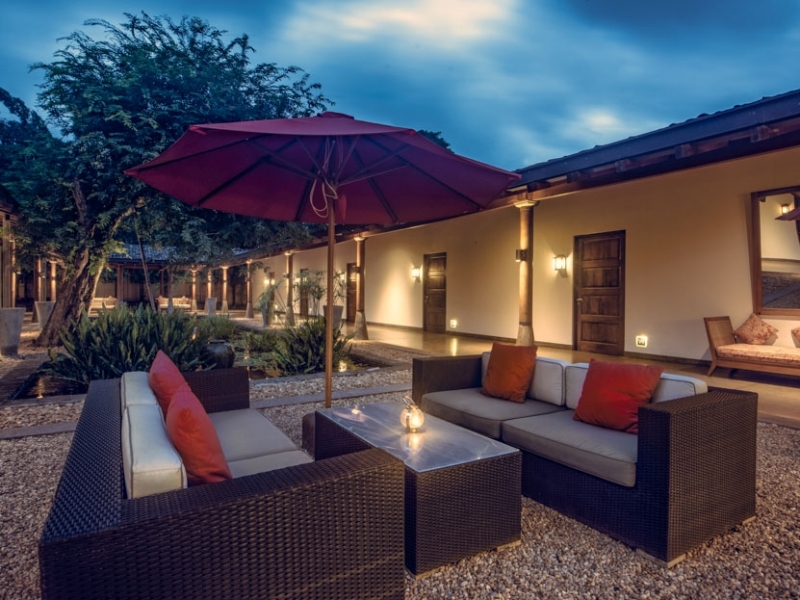 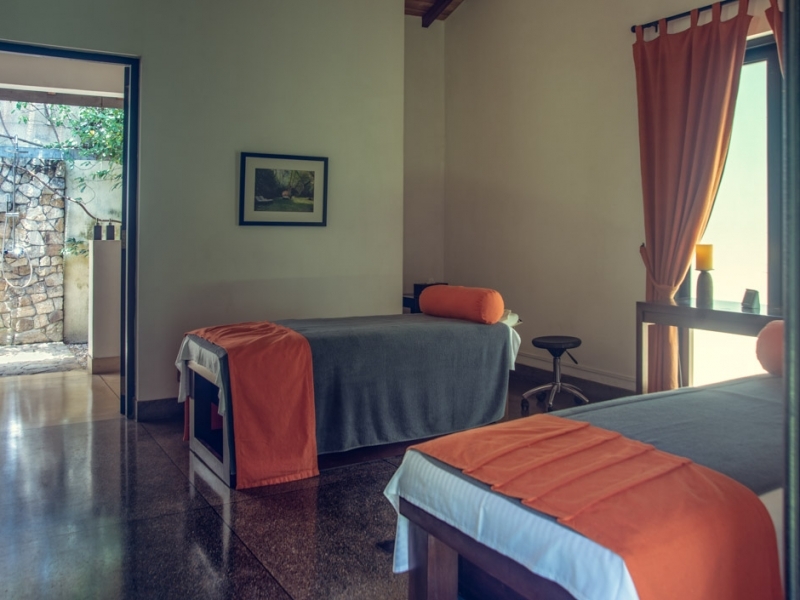 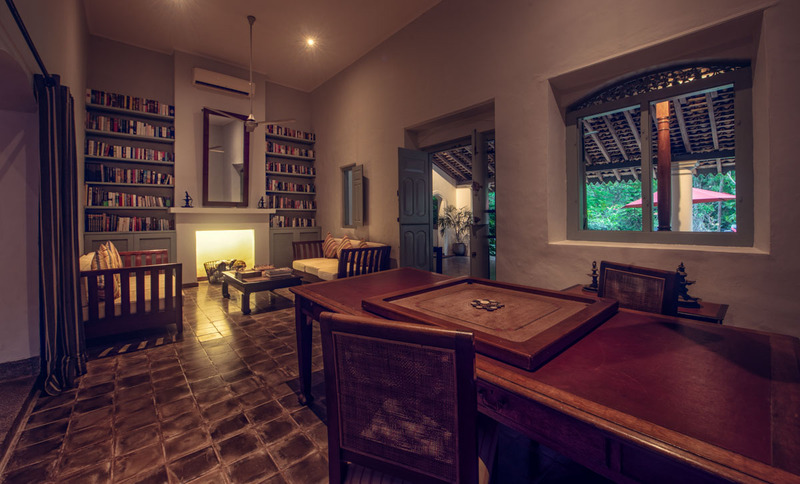 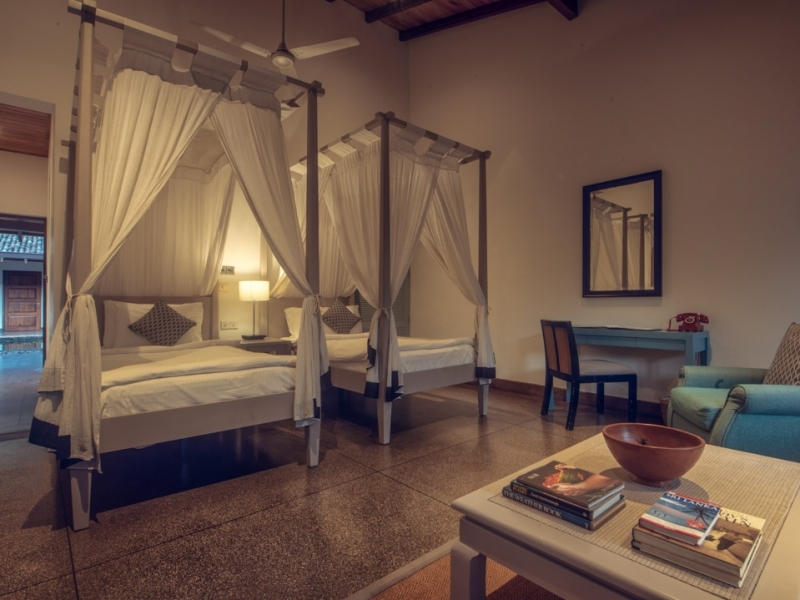 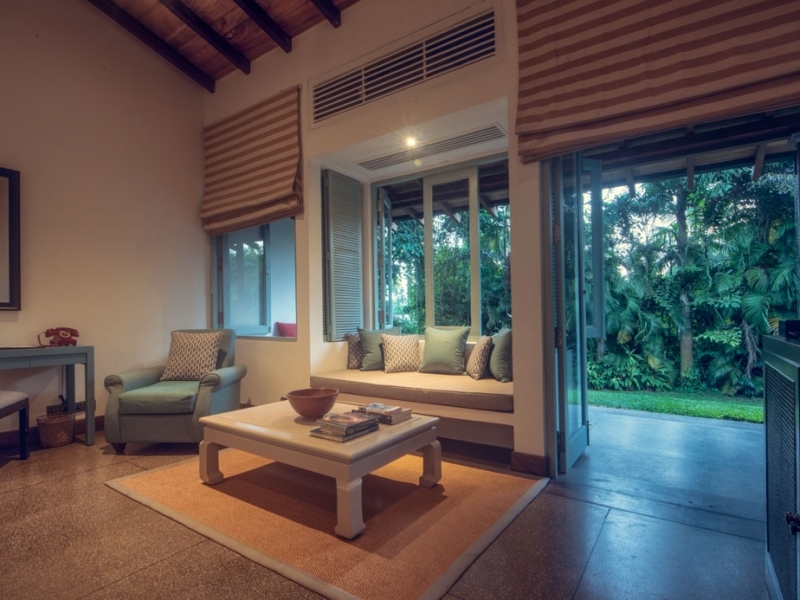 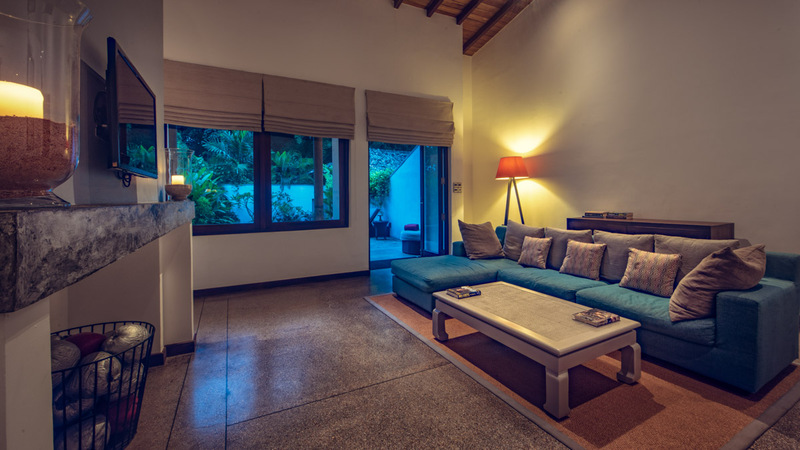 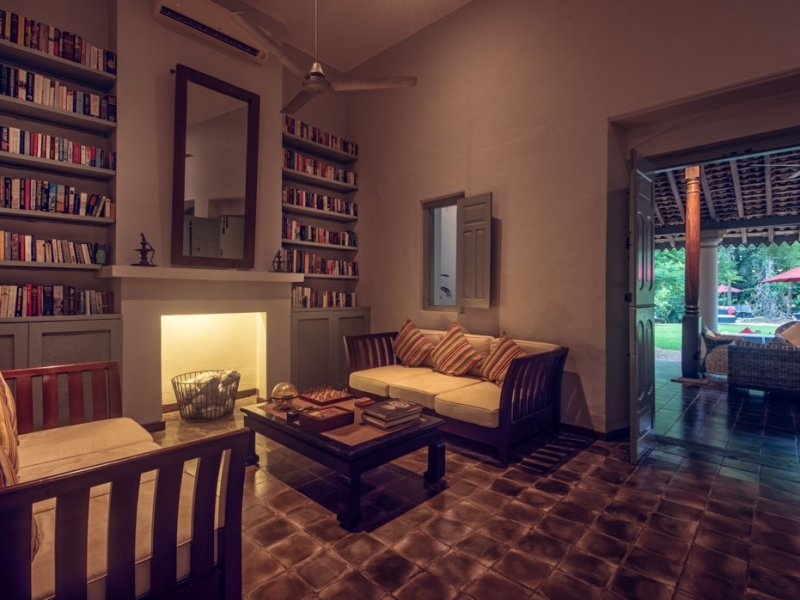 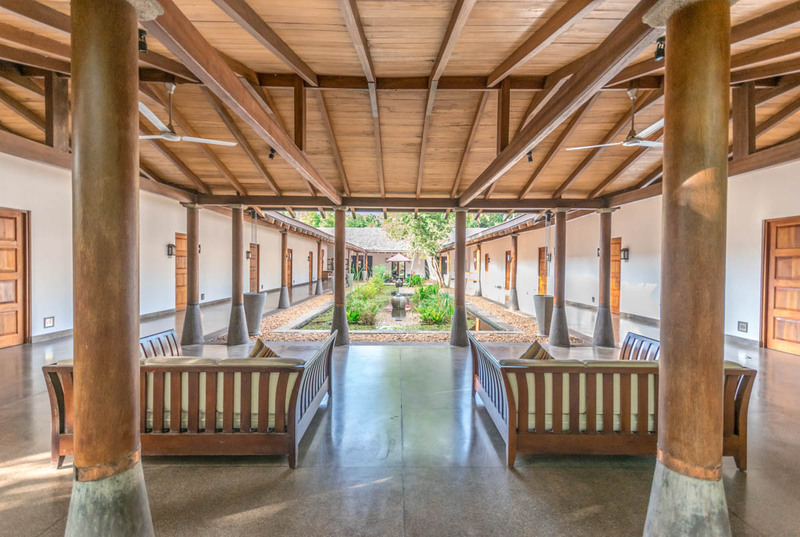 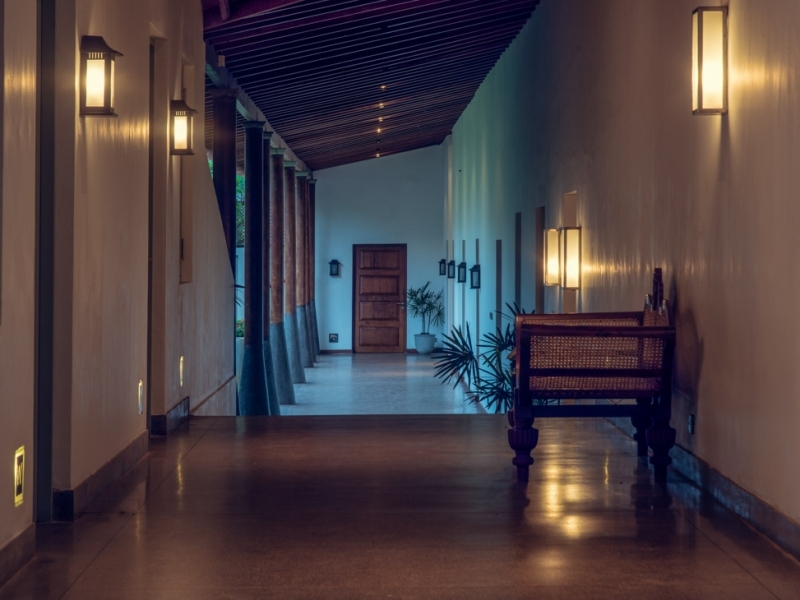 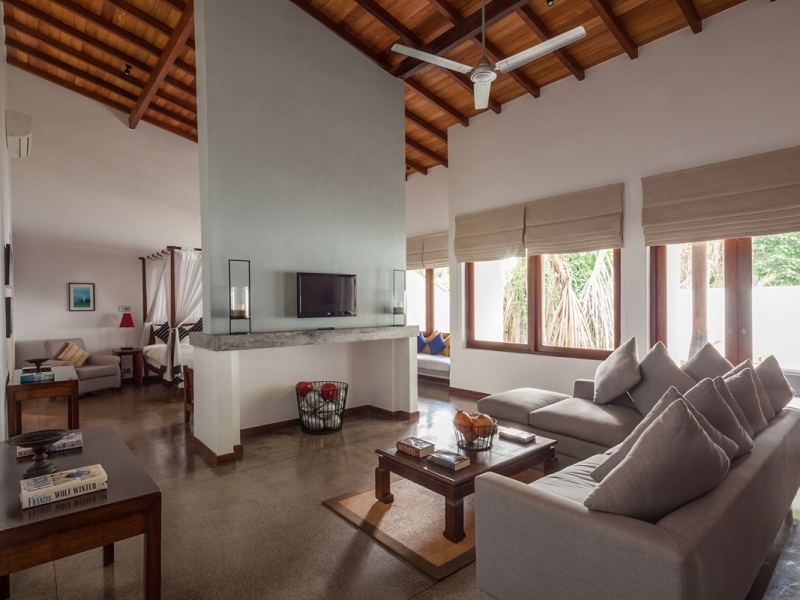 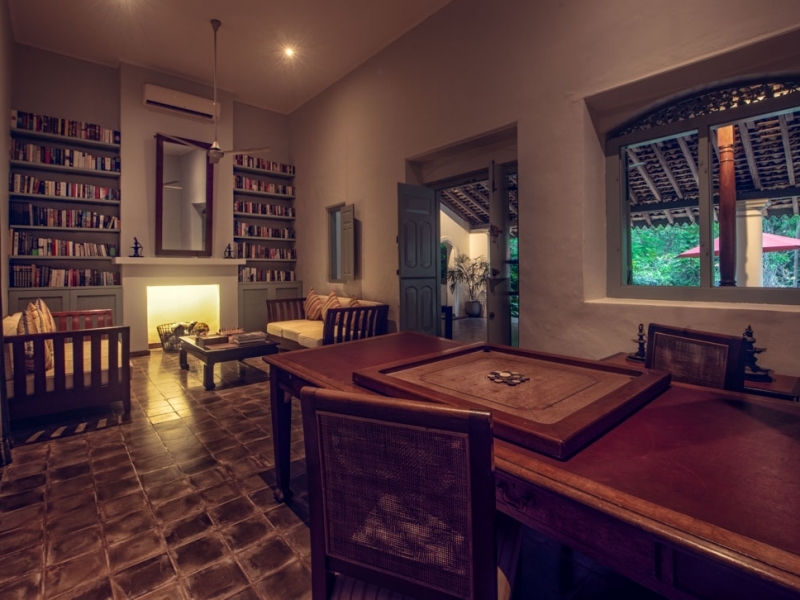 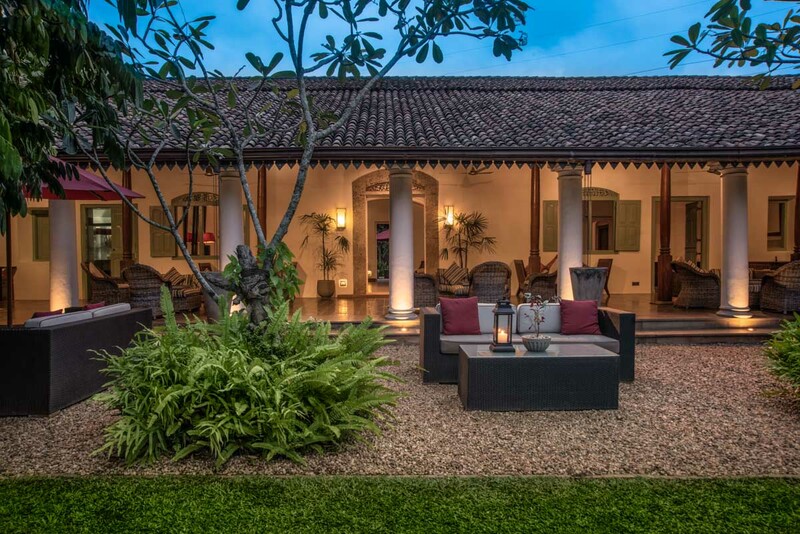 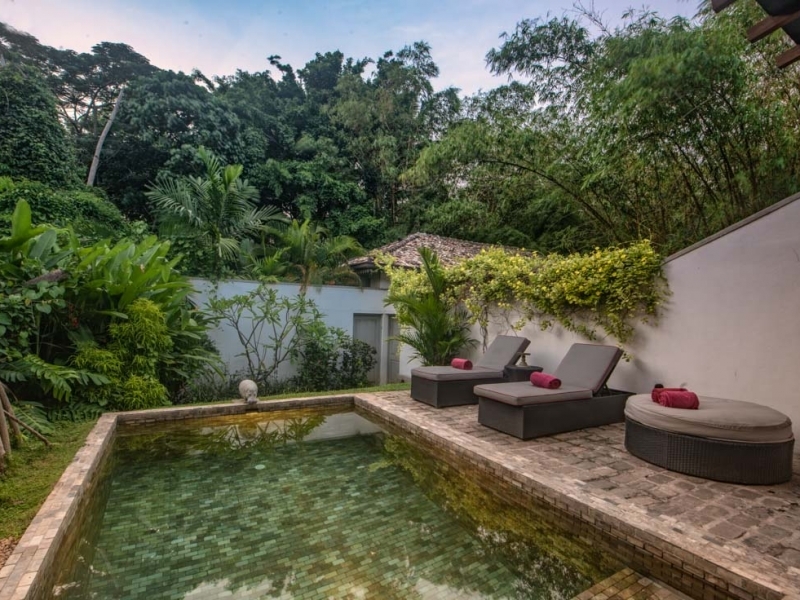 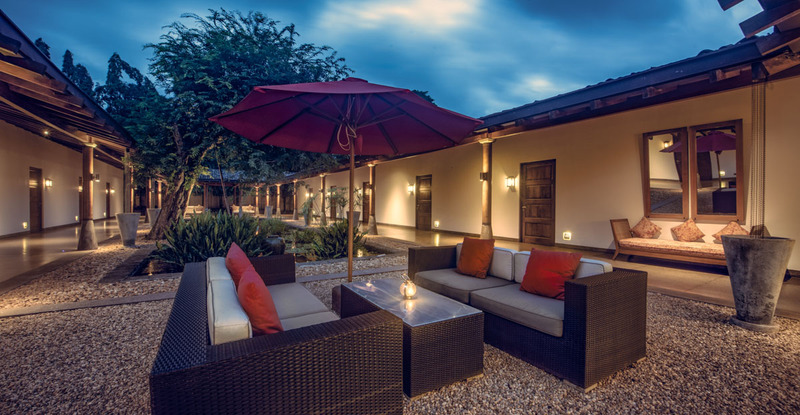 The Wallawwa is conveniently located just 15-minutes’ drive from Colombo International Airport yet its lush setting is extremely tranquil, tucked into a quiet corner of Negombo’s rural hinterland. 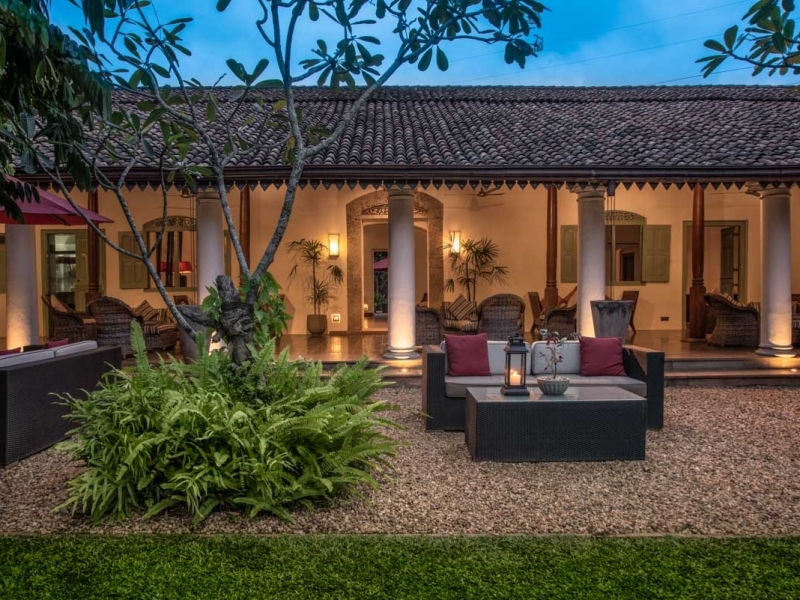 It takes just 30-minutes to reach Colombo and beach-blessed Negombo, a Catholic settlement famous for its fishing trade, its expansive lake and network of old Dutch canals.